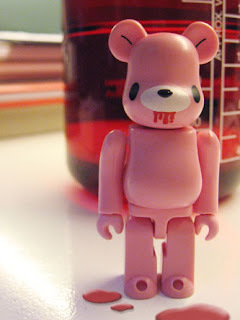 bearbrick love: bears gone bad! Beware! This plastic toy devours little kids! :-o Mori Chack's Be@rbrick (left) is an adaptation of his original Gloomy Bear (below right, eating its owner, Pitty), complete with sharp claws and fresh blood dripping down its mouth. Because Gloomy is a wild bear, he cannot be tamed like a pet dog. In time, his savage instincts are unleashed and he starts to bite the hands that feed him. The designer toy culture is decidedly an adult market, hence, the popularity of toys of a dark nature: little pirate girls like Jurevicius' Scarygirl, Kozik's cigarette-smoking rabbits, Fowler's Monsterism town folks, Dalek's axe-wielding Ice-Bot, and Horvath's Uglydolls. When gruesome teddy bears replace the sweet, button-eyed ones we slept with as kids, we know we've not only grown up, we've also grown different: we've learned to walk on the dark side of life, begun to enjoy the thrill of violence, and found a way to see the beauty of ugly. Congratulations for making it as a finalist in the Philippine Blog Awards. I really enjoy your blog. It's not only about be@rbricks - which I know very little about and won't dare collect - but your blog serves as a springboard for talk and info about art, design, lifestyle in general. That's the value of your blog which keeps me reading on! Hi baba! I am so proud of you!!!!! :-) I didn't realize that your instant addiction to be@rbricks (circa 2005, during a Holy Week vacation in Hong Kong) would bring you instant fame in the blog community! And since I know how you've become an A+++++ bidder at e-bay chasing after "be@rbrick love" from around the globe, I congratulate you big time for the well-deserved recognition! Keep it on!! !